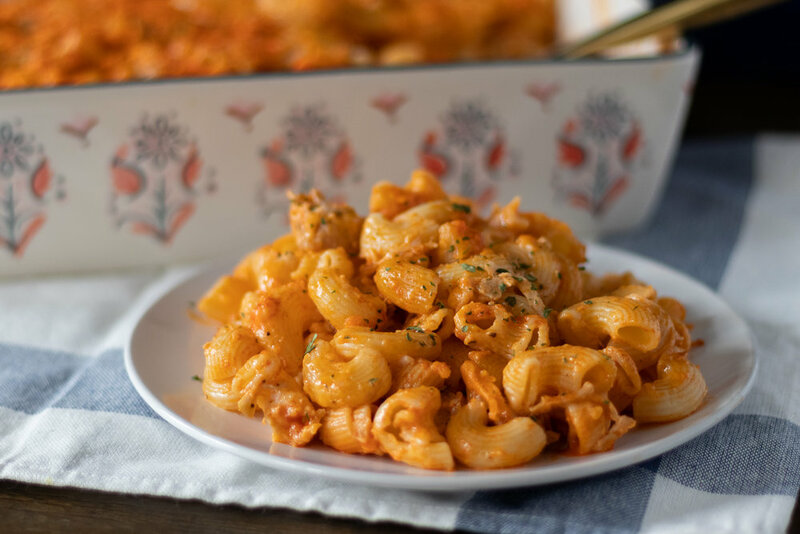 Creamy, cheesy, gooey, spicy, vegan buffalo “Chicken” mac and cheese with jackfruit! 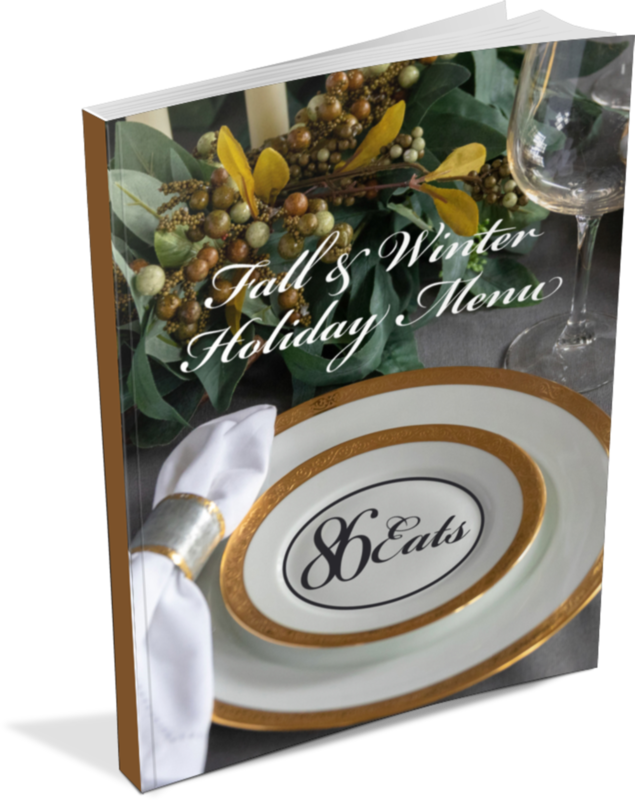 I love buffalo flavored anything, and I super love buffalo “chicken” dip! So taking that dip with a few adjustments and mixing it into macaroni changed my favorite appetizer into dinner (insert me doing a happy dance! )This mac and cheese is hearty enough to be a meal on its own with side salad, or a super delicious side dish!! 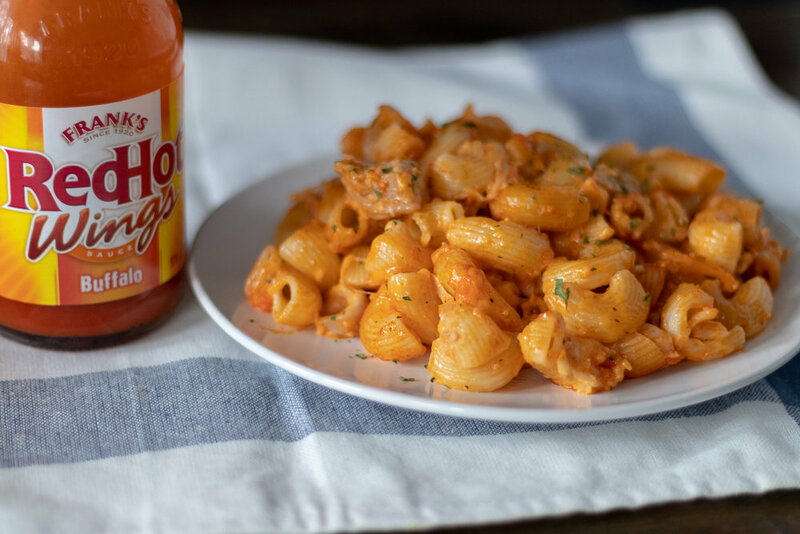 So if you love mac and cheese and you love buffalo sauce on everything too, we might be new best friends! Cook noodles according package instructions. Drain, rinse and set aside. Drain jack fruit, rinse, and chop the pieces, or shred them using you fingers into a medium sized bowl. The fruit pulls apart easily, and I find using my fingers easier than chopping. Add 3/4 cups of the buffalo sauce, 1 cup of shredded cheese, plus the remaining ingredients minus the butter, to the jackfruit and mix well. Add the noodles to the jackfruit mixture and mix well. Transfer the mac and cheese to a 9x12 baking or caserole dish, and sprinkle the top with remaining 1/2 cup of shredded cheese. Melt 2 tablespoons of vegan butter and mix with the remaining 1/4 cup of buffalos sauce. Drizzle the mixture over the mac and cheese. Bake for 25-30 minutes, until all of the cheese on top is nice and melted and the mac is heated through.